I have yearnings to be a minimalist. A minimalist expat. Then I wouldn't have to deal with all those possessions that get bagged and boxed and shipped and stored and moved and schlepped around the globe. I'd be rid of most of that stuff quietly living and breeding in drawers and cupboards and shelves and boxes. 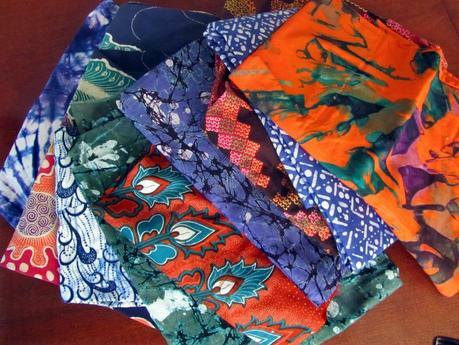 Like all this fabric from Africa - endless colorful meters going unseen and neglected in a storage box. I so loved them when I bought them in Ghana, West Africa. The colors! The designs! Surely I'd find something really creative to do with them. But no, here they are, years later, languishing in the dark. Do you know what these things are? 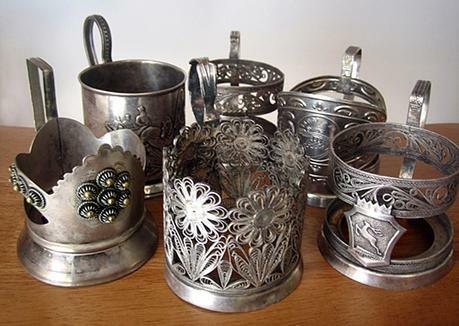 They're called podstakanniki, tea glass holders, the ones you are presented with when you travel on Russian trains, or so I hear (I've never traveled on Russian trains). Why do I have a collection of them? Well, I thought they were so cool when once I was served tea in them in a restaurant in Yerevan, Armenia, a former Soviet republic where I lived the expat life for a good number of years. I thought it would be unique to serve my guests tea in them, so I rummaged around in the Vernissage, the fabulous flea market in the capital of Yerevan, and picked one up here and there, now and then. For fun, you know. But I never ended up getting the glasses that fit in them, and the friends I generally collect along the expat trail are more the wine-drinking types. 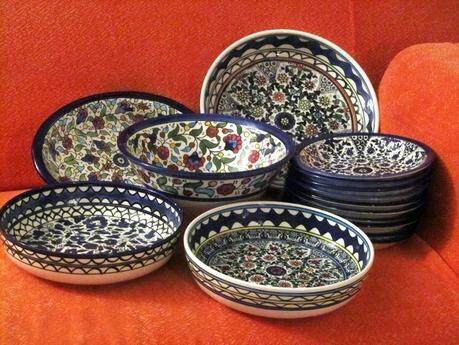 So here they are, my lovely podstakanniki, stashed away in a box on a shelf. I swear I spend my wandering expat life selling and giving away stuff when I move - towels and pots and pans and furniture and clothes. But the universe loves a vacuum it is said, so lo and behold I seem to have more stuff next time around. I don't consider myself a collector of stuff. I don't have shelves full of Elvis Presley memorabilia, handcuffs, music boxes, air sickness bags or dryer lint. I'm not a shopper-I don't like shopping except in funky foreign markets. I'm not much of a consumer unless I'm on vacation to fabulous places like Rome or Paris and spending money on food and wine. Still . . . .
Getting through all the things in the house I hadn't looked at for ages, I had to admit that, really, I do have proper collections. 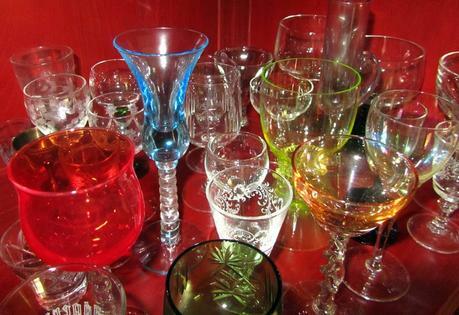 Objects gathered in different places in the world like the above mentioned African fabric and Russian tea glass holders. And more, as you'll see below. And what did I do? Minimalism or not, I was not able to part with them so I shipped them all to our new location. Please don't judge me. 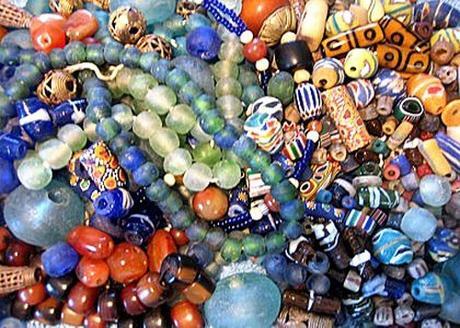 And what about these African beads? I have a large bin full of them, kilos and kilos of them. Why, you ask? Because they are gorgeous and when I lived in Ghana, buying beads was so much fun because they were everywhere and you can make fabulous jewelry with them. And yes, I actually have made a few necklaces. However, I have enough to start a business and string beads from now till kingdom come. But I don't. So the bin with beads now lives in the garage, being no good to anyone. If I want to be a true minimalist, I should just sell or give all of these things away. But I don't really want to. I kinda like these useless trinkets. But rest assured that if the house burned down I wouldn't weep over them. I think. I so admire people who are true minimalists, don't you? I long to be one, really, but I might as well admit to myself that there is no hope for me in the minimalist department.